It has always been my goal to save and protect animals. I rescued and support two horses and have adopted stray cats in past years. Now, with my sculpture, I have a way to increase awareness of endangered species. 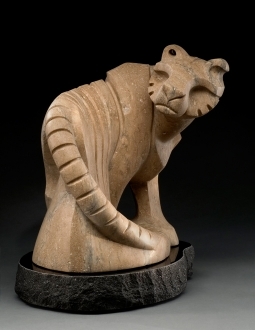 I donate money from the sale of these stone sculptures to help save and protect animals and their habitats. I read abut the work done by Jose Urteaga through Fauna and Flora International in an article he wrote for National Geographic magazine. I was looking for an organization to whom I could donate money to protect leatherbacks specifically–and nesting beaches in particular. The protection of nests and beaches was determined by Dr. Carl Safina in his book, Voyage of the Turtle, to be key to the survival of these ancient and awesome turtles. Fauna and Flora allowed me to earmark my money for this specific program. The sale of “Save the Tiger” allowed me to donate money to Panthera. This organization successfully created a jaguar corridor throughout Central America to allow big cats to travel safely through their territories. Now Panthera is working to organize and create a tiger corridor in Southeast Asia coordinating with other tiger organizations. It became apparent that in the 30 years that tigers have been protected there are now 50% less tigers than there were 30 years ago. Clearly, all the effort and money was not helping to save tigers. Panthera is trying a different course of action by getting tiger organizations to work together to really save tigers. I am so very pleased to be able to put my money where my mouth is. 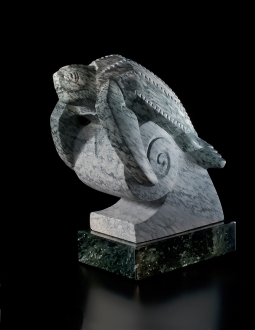 I hope to continue to donate to help save endangered animals through the sale of my sculptures. It feels positive and empowering, and gives another dimension to my life and my art.